Curve Dental will provide you with an organized view of your practice’s financial and patient data with our preferred collection of dental reports for your practice. You can choose from a list of ready-to-run reports that cover all the bases, or you can create a custom report to fit any particular purpose and save it as a template for future use. Curve Dental produces easy-to-understand and professional statements that are more likely to solicit full payment with clear and concise details. They also feature an easy-to-find balance, payment instructions, and a list of other dental appointments for members of the same family. Our crisp, clean approach greatly contributes to more accurate statements. Our dental billing software helps make light work of posting all payments. Payments are automatically applied to the insurance portion or the patient portion, depending upon the payee. And that saves time, which saves money! A day doesn’t go by when adjustments must be made to a number of accounts for a variety of reasons. Curve Dental’s workflow keeps you in one window so you can accomplish this task quick and easy. Send letters using the data in the report. Save reports—you never have to create the same report twice! What’s more, with every report, you can adjust the way the data is presented to the way you want it presented. 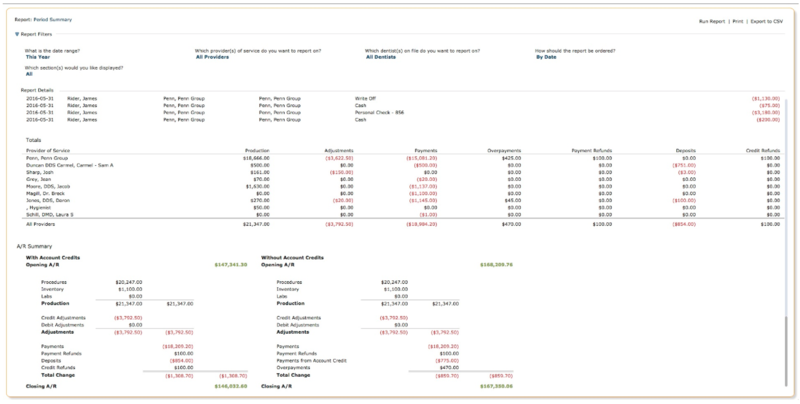 You can reposition a column, add filters on the fly or remove filters—the displayed report will be updated in a flash. Useful Patient Reports. You can view and/or print a collection of reports to help you better understand who your patients are, such as demographic information and medical alerts. Simple Scheduling Reports. You can quickly create and view a scheduling report to see which patients have appointments for any given date, procedure, length, or status for any provider. Relevant Insurance Reports. Insurance management is a daunting task for any dental practice. With Curve Dental managing insurance becomes much more manageable. Effective Clinical Reports. Handy treatment plan reports will help zero in on unscheduled treatment plans, which will boost your bottom line. Accurate Financial Reports. Our software delivers on-the-fly financial information for a number of different purposes: Production, collections, aging, and more! Key Recare Reports. Recare is critical to the success of any dental practice and our reports make analyzing Recare quick and easy. Miscellaneous Reports. You’ll find a collection of other reports to help you build and manage the killer practice. Custom Reports. If you don’t see what you need, you can take an existing report and modify it. Or you can create your own report from scratch.